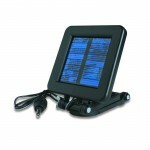 Can be used with a 6V Deer Feeder and can be attached to a solar panel or wall charger for charging. 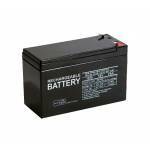 The state-of-the-art lead-acid battery is the valve-regulated type (sometimes called "sealed" or maintenance-free) which fixes the acid electrolyte in a gel or in an absorptive fiberglass mat. The advantage of this design is that the battery needs no water additions can be operated in any position. * Maintenance-free * Sealed no leak design * Higher cranking amps * Lower self discharge * G..
Use this battery tester to test any 6v or 12 v batteries. Perfect for checking your deer feeders. 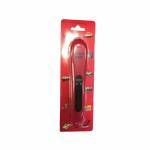 Retractable Probe Tests 6v or 12v Fits in your Shirt Pocket Puts light load on battery Small screwdriver can also be used as a probe. 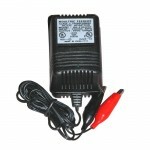 ..
Keep your battery charged with the 6-volt battery charger. 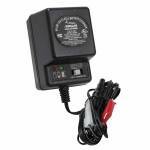 Float charge all rechargeable 6v batteries. 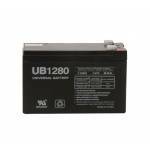 Will never overcharge your batteries. Once battery is charged charger switches to a trickle maintain stage. .. 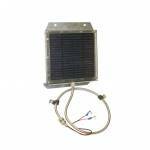 Ensure a continued source of power for your wildlife feeders and trail cameras with Moultrie's solar panel. 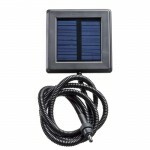 Redesigned connections allow you to plug solar panel into game feeder or digital trail camera (compatible with cameras powered by 6-volt batteries only). Retro fitted with alligator clips for feeders and cameras purchased before June 2007. Trickle charge maintains battery life and will never overcharge 6-volt batteries. Power Cord is 21" ..
No more battery switching or wondering what your battery levels are with the Feeder Power Panel from Moultrie. Combining a 6V battery and solar panel in one unit, the Feeder Power Panel plugs into any Moultrie game feeder with an external power port to supply power from the sun. This convenient power source allows you to run the feeder with no internal battery or in conjunction with a rechargeable internal battery for maximum field life. Features a built-in battery level indicator so you can ch.. 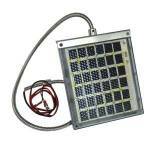 Built In By Passed Blocking Diode Stainless Steel Flex Conduit Shields All External Wiring Sturdy Aluminum Mounting Bracket Clear Polycarbonate Cover (not Glass) 12v, 1.26 watts, 70 MA output Wire conduit is 28" long 6 5/6" x 5 1/2" .. 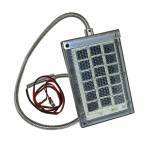 Built In By Passed Blocking Diode Stainless Steel Flex Conduit Shields All External wiring Sturdy Aluminum Mounting Bracket Clear Polycarbonate Cover (not Glass) 6v, .72 watts ..
Can be attached to a solar panel or wall charger for charging. 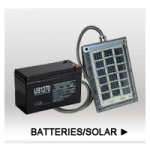 The state-of-the-art lead-acid battery is the valve-regulated type (sometimes called "sealed" or maintenance-free) which fixes the acid electrolyte in a gel or in an absorptive fiberglass mat. 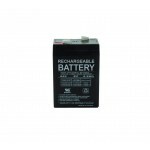 The advantage of this design is that the battery needs no water additions can be operated in any position. * Maintenance-free * Sealed no leak design * Higher cranking amps * Lower self discharge * Greater vibration resistance * Heavy d..
Comes with charge status light indicator 6V and 12V Battery Charger 1 Year Warranty Includes alligator clips and adapter for EBX Battery Kit .. Built In By Passed Blocking Diode Stainless Steel Flex Conduit Shields All External Wiring Sturdy Aluminum Mounting Bracket Clear Polycarbonate Cover (not Glass) 12v, 1.26 watts output Wire conduit is 28" long 6 5/6" x 5 1/2" ..
12 volt solar panel comes with the bracket for an easy mount Stainless Steel Flex Conduit Shields All External Wiring Sturdy Aluminum Mounting Bracket Clear Polycarbonate Cover (not Glass) 12v, 1.26 watts output ..